This is the Hannah's Private Reserve Blend brought to you by Dillanos Coffee Roasters. This unique blend uses the spice notes of Monsoon Malabar to create the foundation for a rich flavor experience. This blend works great as an espresso blend or as a filter coffee, brewed as drip or French Press. 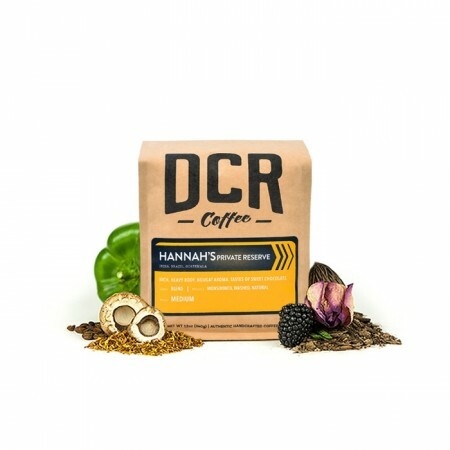 This cup is fantastically full bodied, with a combination of earthy and baking spice flavors. Love this coffee! Very good complimented with some simple sweet cream. I personally brew on a french press and I think it really recognizes the chocolate and baking spices mentioned in the description. Spot on. It was full bodied and smooth as well, a great cup for a former barista of 3 years! This is good, but it is not roasty or dark enough. This one had kind of a weak flavor. It was just okay. I don't remember the specifics as to why it wasn't our favorite because I waited too long to do this review. Sorry about that. I liked it. Very flavorful. Smells great and was not bitter. Really nice flavor to this coffee. My husband loved how strong this one was! Have had this twice and by accident their dark roast. I can't tell the difference! might try a medium or light roast next time. Not sure what flavor notes i can choose from. Too dark and earthy for me. Not a big fan. Good for lattes. Pretty good. For some reason not my absolute favorite but it was smooth and earthy. Liked this coffee a lot more. Bean seems darker and I would say tastes roasty. A solid, enjoyable cup. Flavors mostly as advertised-- this blend has a natural sweetness. What came through for me was less "baking spice" and more earthy cocoa. Great for the holidays. Dark and intense. Solid cup of coffee. I brew it in a ceramic pour over brewer with a tiny bit of sugar. Full bodied, smooth, and the right amount of caffeine. Delicious full body - not bitter at all and hints of chocolate. Delicious! Tasty, the earthy/baking spice flavors weren't my favorite however. Much more our style, more flavor and fuller bodied, darker color - yuM! Made a really good cold brew. The chocolate stood out the most. When I did a pour over it did not as much but was still good. Would buy just for cold Brewing. Always stayed away from medium-light roasts, thinking it had to be dark roast to be coffee! This coffee was so delicious I realize now I was "laboring under a misconception"! too 1 dimensional. not enough depth or flavor for me. If you like your coffee dark and strong this one is great! Can't really explain why, but i really like this one so much that i need to mark it down so i remember. Just perfect. Full bodied, very nutty, notes were as described. Espresso was fine, but not a complex coffee. I was leery of the cinnamon note, but everything combined very well. Still brewing this first shipment (I was a little late getting started). I think it's a descent coffee. I do think it has a slight bitter taste but I'm still getting to know this blend. I loved this coffee! It was my first mistobox coffee and the first I've ever ground up fresh, so maybe I'm biased, but I thought it was very full (I like coffee strong and dark) without being overly syrupy. A serviceable cup of coffee. The bag says light to medium but it's far from what I'd call light. Initial aroma from just the beans is almost smoky--a smell almost distinctively "dark roast. "Brewed as a pour over. Body is full with a good mouth feel. Slightly bitter with some notes of baking chocolate and light spice. Not necessarily my favorite, but perhaps better with milk or when paired with chocolates. A touch bitter but overall a good, strong flavor. Really like this a lot! The kind of coffee I usually gravitate to is classic American diner coffee but higher quality, so this is great. Great aroma but had a burnt taste that I did not enjoy. Loved the hint of spice! Love the deep, rich chocolatey undertones. Good cup of coffee.